On either side of the ceiling of Waiouru, running the full length of the boat, are two 2½" inch wide timber ceiling battens. Richard (the joiner) had mentioned to me that the outside batten on the ceiling left side of the boat adjacent to the wall (that is; in the corner) would need to be removed as the gap would be required to run the 12v wiring. I decided this was a task within my destructive capabilities and so I borrowed a wrecking bar and set to the job. The following photo was taken after I’d removed the timber batten. 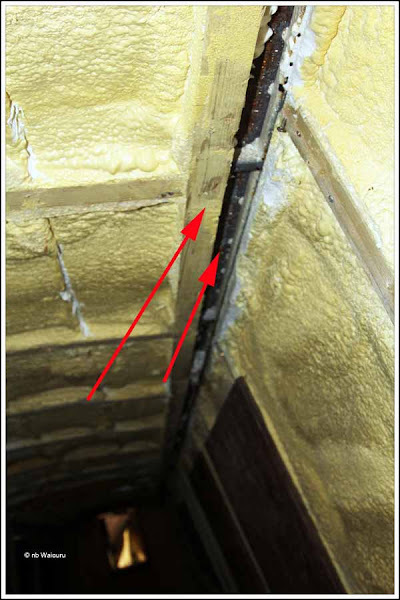 This process left in place the inside batten which will be used for roof fixing (left arrow) and you can see the channel left for the wiring by removing the 2nd batten (right arrow). Now the batten has been removed you can also see there is NO INSULATION underneath the batten. 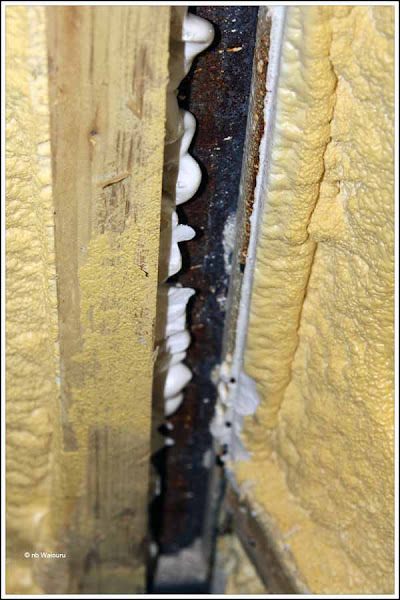 The spray foam penetrated under the inside batten but not under the timber batten I’d removed. If the area had been left like this the boat would have a 2½ inch wide cold seam the full length of the ceiling where we would be losing heat. Whilst Richard had only wanted the left batten to be removed I correctly guess a similar fault would exist on the other side of the boat. So I’ve also removed that batten. When the spray foam contractor comes to rectify the thin foam below the gunwale I’ll also ask for both ceiling channels to receive an inch of foam. This will still leave sufficient room for the wiring loom.